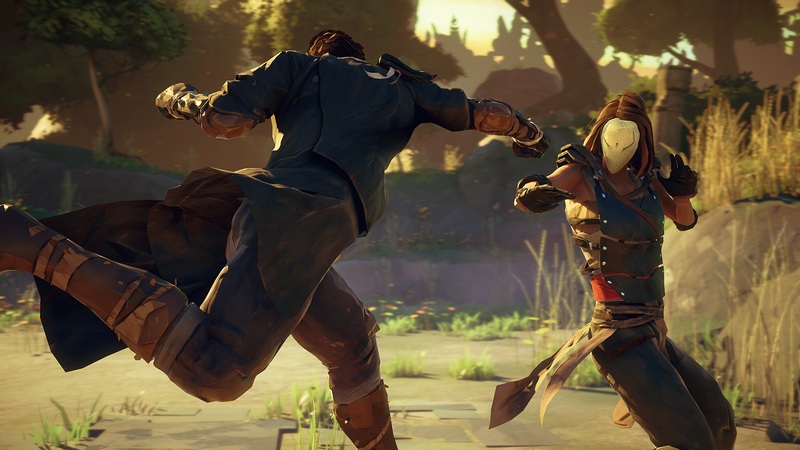 Developer Sloclap’s first game, Absolver, does just that with melee combat. By focusing on one type of combat, it can fully explore the gameplay mechanic by showing the different techniques that fighters use. It’s a great concept for the game, and one that was born from the team’s real-life love for martial arts. This love for martial arts shines in the game, as different styles have all been recreated in the game. From aikido to Krav Maga, I was really impressed to recognize moves I know coming from the in-game fighters. Not only does the 3D combat look fluid, it controls well by allowing players to lock-on to foes by clicking in the right analog stick. Much like in a real fight, the key to combat is knowing how to properly use distance to your advantage and knowing when to attack. By being able to lock-on, it allowed me and my foe to properly circle, attempt to parry oncoming attacks, and really get into the psychology of fighting. The most tense moments in Absolver aren’t during a combination of moves, but rather in-between them. A large part of Absolver revolves around switching fighting styles (you can equip up to four at one time), and choosing what moves to use from those martial arts. Players can create their own combos by customizing a “combo deck,” and they can choose moves that will fit their play-style. Unleashing combos are very satisfying as players have to time their successive attacks if they want them to combo together. This sort of rhythmic mechanic makes sense as you don’t make a speed bag go fast by just punching as hard as possible, but by actually timing your punches. Apart from the satisfying combat, a lot of the appeal of Absolver comes from the game’s mystery. The game takes place in the ruins of a fallen empire, where the player wakes up with a mask placed on them (I was informed that was just a pleasant side-effect that the masks look awesome, and it’s not a fashion choice as I had surmised). The demo I played didn’t reveal many answers as to the world I was exploring, but I still desperately want to know more about it. While players will run around the environment fighting other masked combatants, they’ll also come across real-life players. This is thanks to the game’s seamless matchmaking, and will lead to some telling moments. Since communication seems to be limited, players will have to decide if they will be a friend or foe. It’s something the PSX trailer for the game touched on, and it’ll likely be one of the game’s most interesting features. It’s like Journey if the other player could punch you in the face at any given moment. I’m really excited to see more of Absolver, as it seems like Sloclap has really nailed the combat. Every punch feels satisfying, and the push & pull of combat feels shockingly realistic. The smallest mistake can lead to a series of devastating blows, and that’s what makes it so exciting. I’m looking forward to learning more about the game when it releases later this year on PlayStation 4.